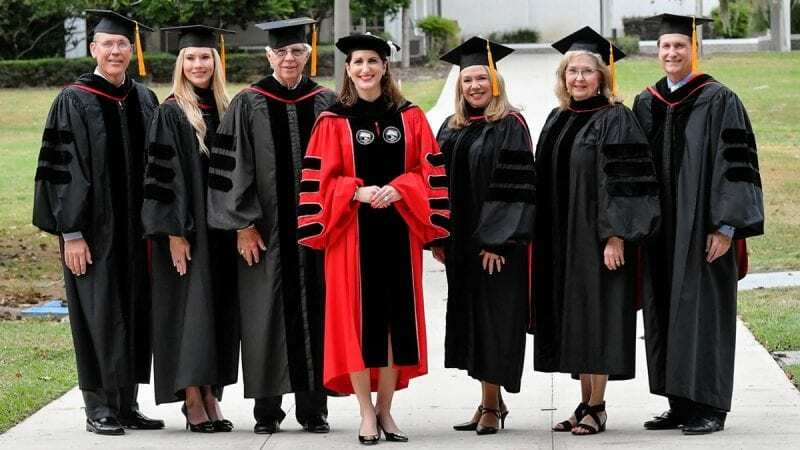 Polk State College inaugurated Dr. Angela Garcia Falconetti as the institution’s fifth president Thursday, culminating a week-long celebration, Falconetti’s first year of service, and raising $155,830 for student scholarships. More than 400 students, faculty, staff, alumni, community members, and representatives from colleges and universities across Florida and the U.S. convened for the investiture ceremony in the Polk State Winter Haven Campus Health Center, where Falconetti was formally sworn into office. “It is with incredible gratitude and honor that I stand before you today as the fifth president of Polk State College, where student success is our success, and everyone plays an integral role in the transformative power Polk State has on students and the greater community,” Falconetti said. Falconetti’s investiture address highlighted Polk State’s rich history, commitment to the community, and focus on pervasive excellence. She emphasized the importance of serving students from all walks of life and continuing to enhance services to ensure they persevere on the path to their degrees. At the core of her message was the College’s mission to provide access to affordable, quality higher education and dedication to filling local workforce needs. — Polk State College President Angela Garcia Falconetti. The Polk County Board of County Commissioners and many municipalities declared Nov. 15, 2018, as Dr. Angela Garcia Falconetti Inauguration Day leading up to the investiture ceremony. Falconetti was named President in May 2017, bringing nearly two decades of service in higher education administration at the state and national levels to Polk County’s state college. 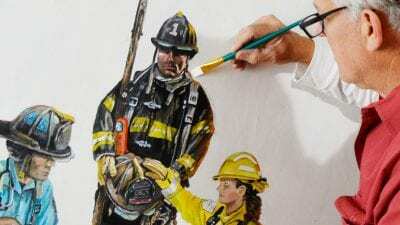 She had most recently served as Vice President of Institutional Advancement at Virginia Western Community College and as Executive Director of the Foundation. In her first year at Polk State, Falconetti focused on building relationships both internally and externally, communicating with community members and hosting forums with students, faculty, and staff to learn what they most value about the College. From this collective input, she developed a vision to strengthen student success and has worked to expand partnerships that provide opportunities and support services for students. Additionally, she advocated successfully at the state level to secure recurring operational funds for the College. Several distinguished speakers Thursday reaffirmed the selection of Falconetti as Polk State’s fifth president. She serves on several boards including CareerSource Polk, the Central Florida Development Council, Club Hispano de Lakeland, the Greater Winter Haven Chamber of Commerce, the Lakeland Area Chamber of Commerce, the Lakeland Economic Development Council’s High-Skill High-Wage Initiative, Polk Vision, The Vanguard School Foundation, the Winter Haven Economic Development Council, and Winter Haven Hospital. She is also an active leader in national and statewide organizations, serving on the American Association of Community College’s Commission on Institutional Infrastructure and Transformation as well as the Steering Committee for the Florida College System Council of Presidents. Also, at the national level, she served as Special Assistant to the first Deputy Assistant Secretary for Community Colleges in Washington, D.C. She ultimately decided, however, that she wanted to serve on a college campus closest to students, faculty, staff, and the community. — Student Government Association Winter Haven President Kieran Sequin. Kieran Sequin, an Associate in Arts student and President of the Student Government Association on the Winter Haven Campus, illustrated Falconetti’s caring and personable approach to serving Polk State’s students. Whether Falconetti is shooting hoops with the basketball team, engaging student leaders in important College discussions, or connecting a student in need to a scholarship opportunity, she is always putting students first, Sequin explained. Through the Polk State College Foundation’s Dr. Angela Garcia Falconetti Scholarship, she can further support students she encounters on the College’s campuses and centers. Donations to the scholarship can be made online at foundation.polk.edu/inauguration. Falconetti, whose parents are Cuban exiles, has a personal commitment to affording students the opportunities that were granted to her and her family through higher education.